Life Beads are a special set of good deed beads that we have created in honour of celebrating life. These Life beads are especially intended for expecting mothers, those experiencing infertility whom are praying for a baby, to pray for the unborn or to be given as a keep sake to those whom have experienced a miscarriage/still born. They can also be used by a pro-life club to pray for 40 days of life or for the adoption of an unborn baby for nine months.These beads are something we have wanted to offer for a few years and after coming across the beautiful image of Our Lady of the New Covenant we knew we had finally found the missing piece. This beautiful painting was created after the artist attend the March for Life in Washington DC. You can learn more about this beautiful picture at Jaunty Fruits. 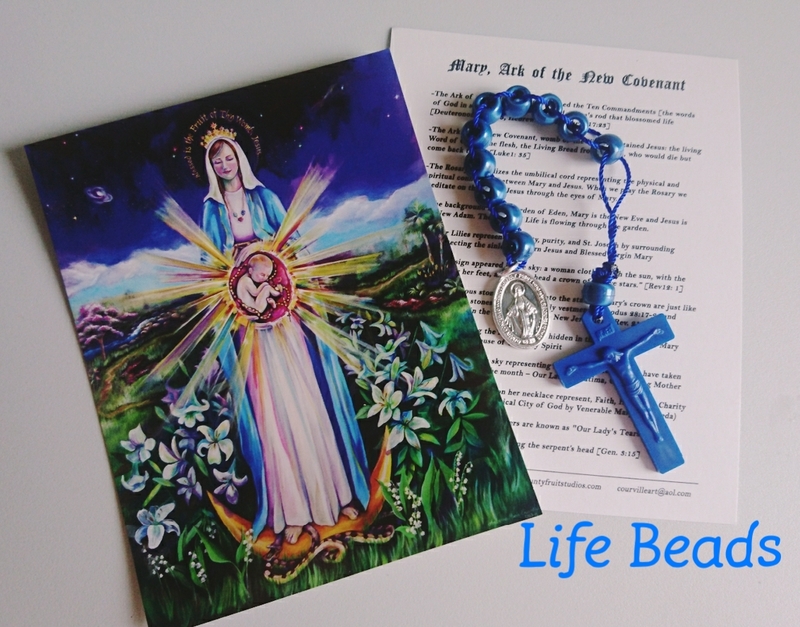 The Life Beads are made with a beautiful blue pearl beads, special blue plastic crucifix, miraculous medal and come with a copy of Mary. Ark of the New Covenant Card.